Guess what I’m craving? It starts with whis and ends with key. Okay, so my riddle skills need work but I really have been craving a new whiskey cocktail to try. And as happenstance should have it, in leafing through Vintage Spirits and Forgotten Cocktails I found a tasty sounding recipe I had marked a while back. It’s a concotion of Scotch, lime juice and ginger beer. Seems like a rather fitting transition cocktail as we pass through fall. Some citrus flavors to remind us of summer and some whiskey to warm us up as winter comes. Shall we get things started? I’ve been drinking a lot of Milk Punch these last couple weeks, as has nearly anyone that came over. Fall is in the air here and the flavors in this drink fit very nicely into my current state of mind. There is the warmth and sweetness from the rum and brandy. There is the warm spice note from the nutmeg. Then there is the warm and subtle, yet complex flavors from the vanilla. You seeing the same pattern here that I did? It’s all so warming on a chilled fall day. Perfect. As I promised in my intro post I went in search of older recipes and found a few in the books on my shelves. However, I didn’t bother to mix any of them up. The reason being, they’re really not that much different. As Dr. Cocktail points out in his recipe, the only real difference is the addition of the vanilla extract. And, while I wouldn’t say the vanilla is essential it really adds a layer of complexity that I think you would wish were there were it omitted. My other suggestions and tweaks are really very simple but key. First, I bumped up the simple syrup a bit because I like this drink a touch sweeter; more on the level of eggnog. However, as with any cocktail that’s something you should experiment with to find your happy balance. Second, use fresh grated nutmeg. I really can’t emphasize this one enough. The nuts keep for about a thousand years in their whole form and the flavor of fresh grated simply can’t be matched by something pre-grated. Heck, if you really don’t want to go buy some of your own, come over here, I’ll give you a couple. I have tons. It’s really that important. Third, use brandy and that you would be willing to drink on their own. I think this should go without saying, but I wanted to include it here to drive home a point. I feel cocktail making is like cooking with wine. In cooking you never use a wine you wouldn’t drink on it’s own. Same goes for cocktail making. That’s certainly not to say that you should use the best stuff you have on the shelf, but please don’t use crap ingredients. It really shows in the final product. Ok, enough ranting. You’ve got the idea. Lastly, a tip. If you’re wondering how exactly one measures two dashes of vanilla extract or any other ingredient that doesn’t have a dasher here’s what I do. I use a cocktail straw. Dip it into the liquid, get as much as you want, cap the end with you finger, drop it into your shaker. For this drink I used two straw loads approximately 1/3 full each time. That gave me the vanilla level I like. So, here’s what I suggest. 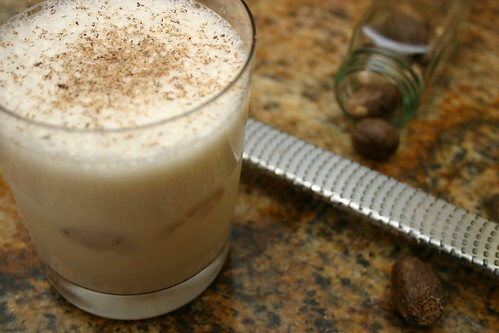 If you’re in the northern hemisphere* and fall is closing it’s chilly hands around you, whip up a milk punch some evening. It’s warming and I bet you won’t have just one. *Supposing you’re not in the northern hemisphere, or you’re reading about this recipe when it’s hot out, consider this idea. Brunch. Enough said. Vanilla extract is one of those ingredients that we all have sitting in our cupboards and, I would venture to guess, most of us don’t know the first thing about it. I certainly didn’t. That is, until I started learning digging in to the facts about vanilla a year or so back. But let me back up a bit. As a kid I was always into cooking and baking. In my travels, well, more correctly stated, sedentary TV watching, I remember watching a ton of TV Food Network (what is now simply Food Network) one summer. I watched anything and everything that came on. During one of the programs I remember a brief discussion about the vanilla that was being put into the recipe and how one should use pure vanilla extract rather than vanilla flavoring. The latter having been derived from wood rather than actual vanilla beans. So, being a curious kid, I checked our cupboard and lucked out, we already had pure vanilla extract. Though I was a changed lad. From that point on, whenever I needed vanilla, I was always careful to buy the good stuff and that’s where the story gets boring. At least until last year. Sometime last year I read a blog post on making your own vanilla extract. Sadly I can’t remember where I saw it, but it got me thinking. I had a few vanilla beans at home that needed application and I knew I could get some more good ones from my local spice shop. On top of that, the process was easy enough; combine your alcohol of choice with some sliced vanilla beans, shake and wait. No problems at all. That is, until I went to Savory to get those additional beans and was a bit startled by what Dan told me. He said that commercial vanilla extracts use about 140 beans per gallon of alcohol. I was floored. In reading the wikipedia article, and subsequently the FDA site, about vanilla extract Iwas able to confirm what he had said. Specifically, per the US FDA, vanilla extract must contain at least 35% ABV and no less than 13.35oz of vanilla beans per gallon. Which works out to ~8-9 beans per cup. It started making more sense why vanilla extract is so expensive at the store. Despite my shock, I wasn’t deterred and here’s the recipe I ended up using. Dirt simple and, if you buy your beans in bulk from an internet source or local spice shop, not all that expensive. Plus you get some serious benefits that you don’t from the commercial products. First, you know exactly what’s going into the final product. Second, you can choose the type of vanilla bean you like. If you’re unsure, go with bourbon vanilla beans. Third, you get to choose the spirit you like. I go with rum because I think it has a very complimentary flavor and the sugary notes really go well with the vanilla. However, you could just as easily go with vodka for a more pure vanilla flavor or whiskey if you want to mix things up a bit. Fourth, you get little vanilla seeds with the extract. True, this won’t be a plus for everyone, but I like it. I think it makes things more natural. A couple final notes before I let you go. When you start to deplete your extract supply simply top up the jar with alcohol and add an appropriate number of fresh beans. You can pull out the old beans if you need the room. Please don’t dump the vanilla hulls if/when you pull the out of the jar. Dry them and put them in with sugar to make flavored vanilla sugar. Mmmm…vanilla sugar topped creme brulee. So, there you have it, my vanilla extract journey. I’m certain I’ll be making homemade going forward. It’s really good and I love being able to make my ingredients at home.